While Insurance for manufactured and mobile homes is very similar to regular homeowners insurance, there are some important differences. Unfortunately many insurance companies and agents don’t understand these differences, and leave their clients in a bad spot when it comes to a claim. The team at Gila Insurance Group has been specializing in these insurances for many years before Gila Insurance Group was in existence. We only work with high quality insurance companies that specialize in these types of insurance. These companies include American Modern Insurance Group, American Reliable Insurance Company, and Foremost Insurance Group. With our mix of knowledgeable agents and specialized companies we are confident that we can get you quality coverage at an affordable rate every single time. What makes our manufactured home insurance policy different that many of our competitors? Specialty coverage. Below are just a few of the options that not everyone will offer. These coverage options vary by state and by company, and are not available everywhere. These options are not automatically included. If you are interested in this coverage, please discuss with your agent if one of these coverage options is something you would like to add to your policy. Total Loss Deductible Waiver – In the event of a total loss, you will have mounting bills. Additional Living Expense, Loss of Rent, Loss of Personal Property, and a Deductible? Not with some of our carriers that will waive the deductible in the event of a total loss. Not a bad deal in what will certainly be a hard time. Golf Cart Coverage – If you have reached the age of having the Golf Cart be your primary vehicle around your community, we can cover it for both physical damage and Liability. Personal Property Replacement Cost – Couches, Beds, Piano, Electronic, the list goes on and on. In the event of an accident, what would it cost to replace your stuff? Probably a lot more than you might think. Plus, with an unchanged policy, you will only get the actual cash value of your stuff. Meaning depreciation will be taken off the top, which means you will get less for your stuff unless you add this coverage to your policy. This change to your policy means that rather than having your stuff depreciated before you are paid, you would be paid the replacement cost of your stuff. In this case, you would get paid to buy “like kind and quality” so if you have a high-end TV you would get a high-end TV, if you have a low-end TV you get a low-end TV. You will not, however, get a high-end TV if you had a low-end TV. 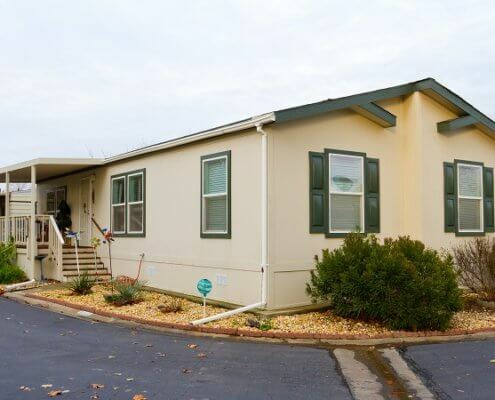 Replacement cost for partial losses – This is an interesting coverage for Manufactured Homes. While not true in all cases, manufactured homes depreciate in value. So, in the event of a loss, you face this depreciation thing again. What is the value of 7-year-old siding? or 5-year cabinets. This can clearly be a problem. However, when you add this change to the policy, you eliminate depreciation, which can muddy the waters, and makes your payout less. Breakdown Coverage – This protects you from systems and appliances that breakdown. It does come with a $500 deductible, but can provide great coverage for HVAC, systems and other large ticket appliances, for a low yearly cost. Waterback Up of Sewers or Drains – Yuck! but it happens and it can be expensive. For a low annual price, you can get this coverage, which is typically excluded.